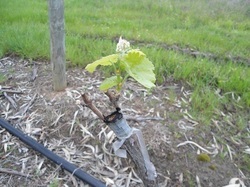 Wine growing is subject to changes and from time to time a variety will go out of vogue. 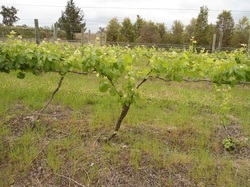 It takes several years to get a vine up to production and if vines were just removed and new ones planted it would mean several years of lost or lower production. 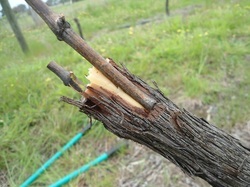 If they are grafted it takes advantage of the established rootstock and production is much earlier. Here I have cut the top off a vine, done a cut in either side and then made two approach grafts (whip and tongue graft on the side, making sure you align the cambium layer up on at least one side). I used weak solution of Clonex rooting hormone in water to coat the cut section of the scion with an eyedropper. 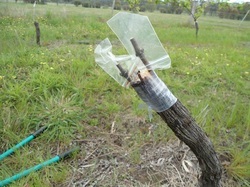 Then taped it up with the heaviest grafting tape I can buy, then put a press seal bag over each graft with a corner cut out to ventilate it on hot days. What you hope to see in 6 weeks time, the bags taken off after reasonable growth and well before this picture taken. Usually one will out grow the other. After a year reasonable production and after two years near full production, these were grafted two years ago.